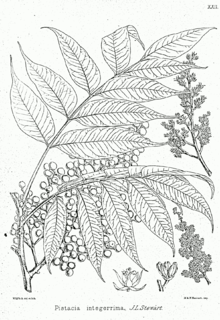 Pistacia integerrima is a species of pistachio tree native to Asia, commonly called zebrawood. It is often classified as Pistacia chinensis ssp. integerrima. It is used for a variety of purposes in India, including timber, dye, and fodder. It is used widely as an herbal remedy for many ailments, including cough, asthma, fever, vomiting, and diarrhea. Long, horn-shaped leaf galls that often develop on this tree are harvested and used to make kakadshringi, an herbal medicine for diarrhea in northern India. This tree is also used as a rootstock in the cultivation of commercial pistachios. Its common names in Hindi include kakar singhi, kakra, and kakring. ↑ "USDA GRIN Taxonomy". Retrieved 21 November 2014. ↑ "The Plant List: A Working List of All Plant Species". Retrieved 21 November 2014. 1 2 Pant, S. and S. S. Samant. (2010). Ethnobotanical observations in the Mornaula Reserve Forest of Kumoun, West Himalaya, India. Ethnobotanical Leaflets 14 193. 1 2 Upadhye, A. S. and A. A. Rajopadhye. (2010). Pharmacognostic and phytochemical evaluation of leaf galls of Kakadshringi used in Indian system of medicine. Journal of Scientific and Industrial Research 69 700. ↑ Nikpeyma, Y., et al. Budding success of Pistacia integerrima on different Pistacia rootstocks. ISHS Acta Horticulturae 470: II International Symposium on Pistachios and Almonds. This article is issued from Wikipedia - version of the 10/13/2015. The text is available under the Creative Commons Attribution/Share Alike but additional terms may apply for the media files.